Back when I first read City of Bones, I picked up City of Ashes. I opened the book, read the prologue, closed the book - and never opened it again. I can't even tell you what went wrong; as best as I can figure out, I simply wasn't in the right mind frame for it. But whatever it was, it nagged in my head for a long time afterwards, and made it difficult opening the book again. But this weekend, I decided I've had enough of it. I took City of Ashes, and City of Ashes only, with me for a short vacation with my parents, thus guaranteeing I'll read it. Turns out, I needn't have worried - I didn't need much initiative to read the book once I started. In fact, despite it being a very busy weekend filled with shopping and outdoors activities, I still managed to read about 100 pages a day! 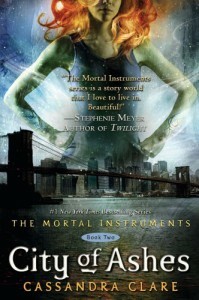 City of Ashes, for me, was a lot better than City of Bones. Can't even put my finger on exactly how, but that's how I feel.